Papercrafts by Patti: July Pals Blog Hop: It's a Pattern Party! 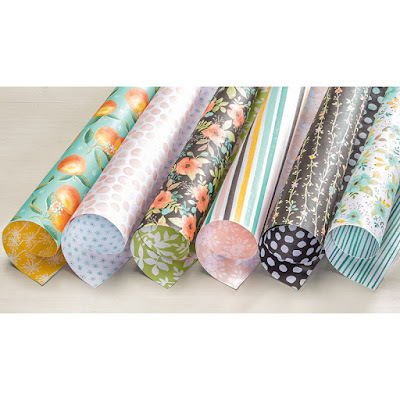 July Pals Blog Hop: It's a Pattern Party! 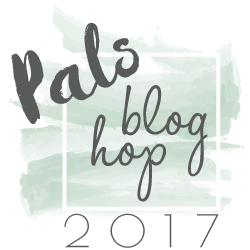 Welcome to the July 2017 Pals Blog Hop. Thank you so much for joining us today. This month we're having a Pattern Party! Hoppers will feature projects using their favorite Stampin' Up! 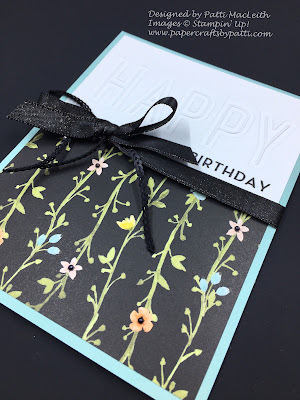 Designer Series Paper and coordinating embellishments. 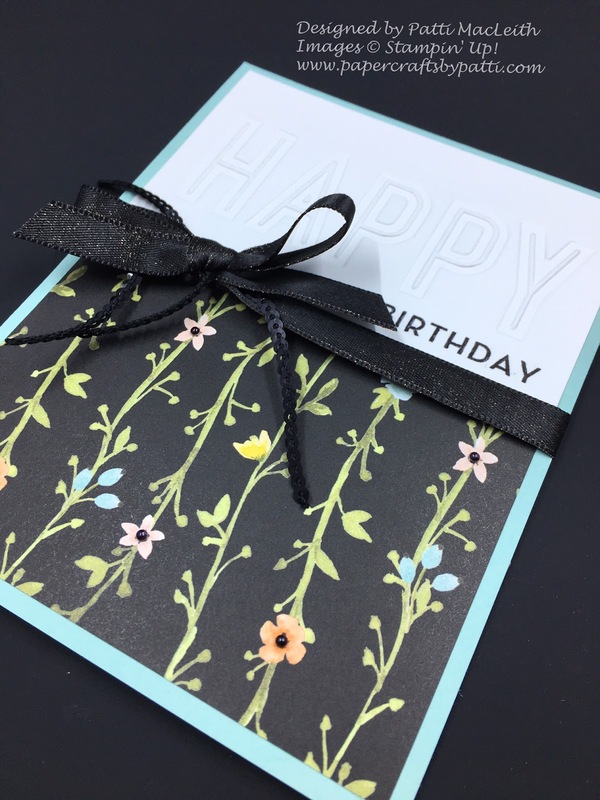 After all, color coordination is a Stampin' Up! strength. Whether you're justing starting the hop, or have come from a previous Pal's blog, you'll find the line-up toward the end of my post to help you move along. It's mighty hard to pick just ONE pattern when you have a package of designer series paper such as Whole Lot of Lovely. The fun thing is that once you choose the pattern you wish to use, the coordinating embellishments and ink and papers pop out at you from your supplies! Here I added a card base in Pool Party and some Basic Black Shimmer Ribbon along with a few strands of Black Mini Sequin Trim. It was the first time I used the sequin trim and I love it! It's hard to see in the photo how much it shines, but it does! I like how they "drip" down like those vines on the paper. Lastly, I colored some Basic Pearls using a black Sharpie and added them to the center of the flat-petal flowers on the paper. 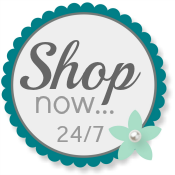 Any time you are ready to purchase you Stampin' Up! products, please use my Online Store. Please take a minute to mark your calendar for our next hope on August 9, 2017 when our projects feature "cuts" from punches, dies, framelits, edgelits or thinnest. Now hop along using the Blog Hop Line-Up below. Thank you so much for hopping with the Stampin' Pretty Pals today. See you on August 9th! Stesha Bloodhart at Stampin' Hoot! 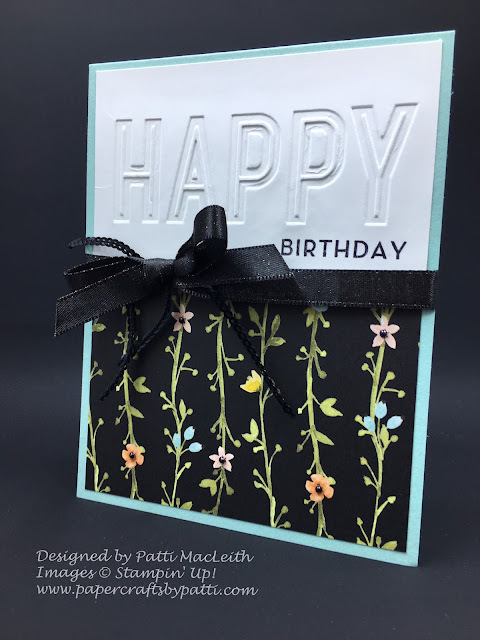 Gorgeous card Patty! I love the little black pearls too. Stunning! Patti, this is just such a lovely card. 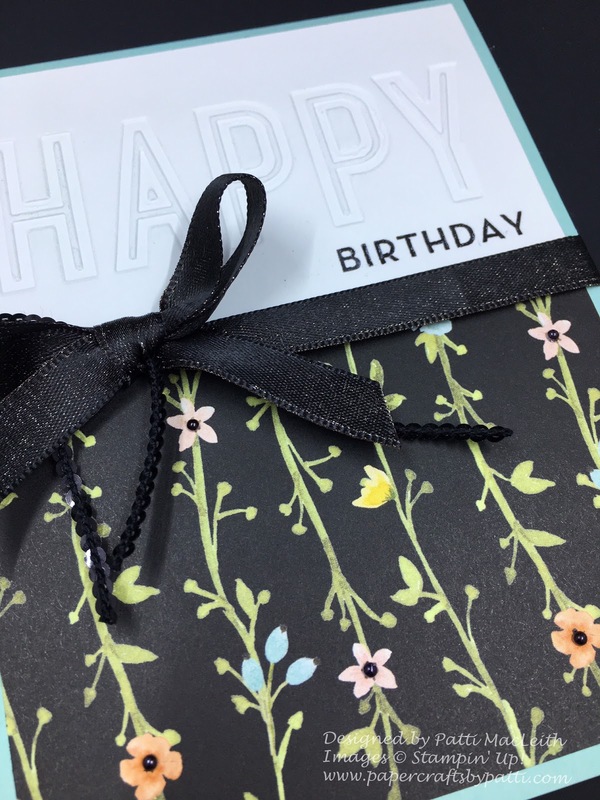 I love the black shimmer accent of ribbon with this pattern paper 🙂 Thanks for sharing. I love your card and choice of DSP! So pretty! Your card is a "whole lot of lovely," Patti! Funny that I have not thought to put DSP with this embossing folder. I love the result. Thank you for the inspiration.